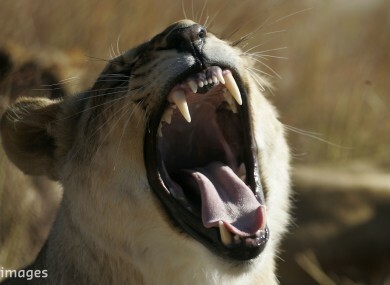 A quarter of the main land carnivores’ prey are now threatened themselves. THE WORLD’S TOP land carnivores such as tigers, lions and jaguars are coming under threat as their prey dwindles in number, according to the first global study of feeding patterns. There are only 17 four-legged predators – big cats, wolves and wild dogs – that weigh more than 15kg and whose diet is at least 70% meat. Collectively these fearsome carnivores feed on nearly 500 species, ranging in size from mice to buffaloes. But a quarter of these are themselves listed as threatened by the International Union for the Conservation of Nature (IUCN), which tracks the health of the planet’s fauna and flora. The knock-on effect means that 11 of the top predators face varying degrees of extinction, including lions, jaguars, clouded and snow leopards, tigers, and the critically endangered red wolf. All but two of the 17 – the grey wolf and the Eurasian Lynx – are on the decline. Up to now, experts have mainly blamed two culprits for the decline in large predators, both stemming from human activity. Our species tracks and kills big carnivores as trophies, food or allegedly medicinal potions, as well as to eliminate threats to livestock. An expanding human footprint has also reduced the vast areas these wide-ranging hunters need to thrive – on average, it takes about 10,000kg of prey to support 90kg of carnivore biomass, whether a scrawny dingo or a strapping lion. But this new study, published in Royal Society Open Science, adds a third critical category of threat which, on current trend lines, could spell doom for many of these top predators. “Our paper is the first to assess the extent to which large carnivores face prey depletion at a global scale,” said Christopher Wolf, a professor at Oregon State University and co-author, with colleague William Ripple, of the study. “For the 17 large carnivores that are dependent on meat for survival, we identified 494 prey species and found that a large portion – 25% – is currently threatened with extinction,” he told AFP. For example, more than half of prey species hunted by the tiger, along with two types of leopard, are threatened, the researchers found. “These predators cannot persist without sufficiently abundant prey,” Wolf added, calling for a more “holistic” approach to conservation that not only protects large carnivores but their prey as well. Failure to do so is likely to result in a downward spiral, he said. The best solution, he said, is to enlarge protected areas and stem the poaching of big cats and wolves along with the animals they eat. But this may be easier said than done. According to one estimate, current spending on terrestrial reserves in developing countries – where the problem is most acute – is less than 5% of what is needed for effective conservation. There are practical reasons to prevent top land predators from going extinct in the wild, the researchers argue. Large carnivores keep the population of other animals in check, and help prevent a cascading chain of imbalance in ecosystems. Animal tourism is also an important source of income in the developing world, notably in 11 of the 12 countries home to 80% of the world’s poor. Email “New study shows tigers, lions and other carnivores becoming endangered as prey dwindles ”. Feedback on “New study shows tigers, lions and other carnivores becoming endangered as prey dwindles ”.